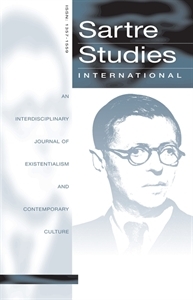 Sartre Studies International publishes articles of a multidisciplinary, cross-cultural and international character reflecting the full range and complexity of Sartre's own work. It focuses on the philosophical, literary and political issues originating in existentialism, and explores the continuing vitality of existentialist and Sartrean ideas in contemporary society and contemporary culture. Each issue contains a reviews section and a notice board of current events, such as conferences, publications and media broadcasts linked to Sartre's life, work and intellectual legacy.